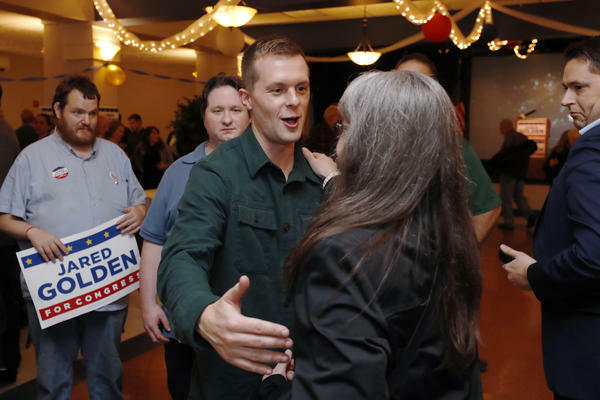 Democrat Jared Golden greets supporters as they wait on Election Day in Lewiston, Maine. Golden was declared the winner on Thursday as a result of the state's new ranked-choice voting system. Democrat Jared Golden was declared the winner Thursday in Maine's 2nd Congressional District after trailing Rep. Bruce Poliquin in the initial tally of votes. But Golden was declared the winner thanks to Maine's new ranked-choice system of voting, which allows voters to rank candidates in their order of preference and to transfer their votes if no candidate gets more than 50 percent. It's the nation's first use of ranked-choice voting in a general election for a congressional seat. Maine voters ratified ranked-choice voting via a ballot initiative two years ago. Golden thanked supporters on Thursday, telling them he would not raise money from lobbyists and corporate PACs and would stay accountable to his constituents. While Golden was behind Poliquin by roughly 2,000 votes after initial voting, he won in the second round of the runoff by picking up second- and third-choice rankings from voters who chose independents Tiffany Bond and Will Hoar as their first or second choices on Election Day. The final vote was 50.53 percent to 49.47 percent, or about 3,000 votes. This brings Democrats' net seat gain to 35. As counting continues in various close races around the country, Democrats could ultimately pick up as many as 39 seats. These are the most House seats Democrats have picked up in a generation — in any election since the wave election after Watergate in 1974. Thursday's result also means New England Republicans have been wiped out in the U.S. House. Maine Sen. Susan Collins is the only Republican from the region left in Congress. The heavily scrutinized count was conducted amid a last-minute legal challenge in federal court by Poliquin and three voters in Maine's 2nd Congressional District. Poliquin's attorney claimed that Maine's ranked-choice-voting law violated the U.S. Constitution in multiple ways. However, Poliquin's request to halt the count by restraining order was denied by U.S. District Court Judge Lance Walker. Walker held a two-hour hearing on Poliquin's request Wednesday, just as state election officials were finalizing the process of scanning ballots for Thursday's final runoff tabulation. In a statement released after the results were announced, Poliquin said that he would continue to pursue his lawsuit. "It is now officially clear I won the constitutional 'one-person, one-vote' first choice election on Election Day that has been used in Maine for more than one hundred years. We will proceed with our constitutional concerns about the rank vote algorithm," he said. Golden said he respects Poliquin's decision to press ahead with his lawsuit. In addition to the recounts in Florida and outstanding vote in the Georgia governor's race, there are still seven House races to be called. Of those, Democrats may very well win four. Look to California's 39th and 45th congressional districts, as well as New York's 22nd and Utah's 4th. In California, there are still some 3 million votes left to be tallied, according to the latest numbers from the California secretary of state's office, updated Wednesday afternoon. In California's 39th District, Republican Young Kim is now ahead by just 122 votes over Democrat Gil Cisneros, who continues to close as more ballots are counted in Orange County. The Democrat in the 45th District has now pulled well ahead. Republicans are leading in three other uncalled races — Georgia's 7th, New York's 27th and Texas' 23rd congressional districts — and appear in stronger positions in those. Copyright 2018 Maine Public. To see more, visit Maine Public.